The Low Impact Development Treatment Train Tool (LID TTT) has been developed by Lake Simcoe Region Conservation Authority (LSRCA), Credit Valley Conservation (CVC) and Toronto and Region Conservation Authority (TRCA) as a tool to help developers, consultants, municipalities and landowners understand and implement more sustainable stormwater management planning and design practices in their watersheds. The purpose of the tool is to analyze annual and event based runoff volumes and pollutant load removal by the use of Best Management Practices (BMP)’s and Low Impact Development (LID) techniques. The LID TTT provides preliminary water budget analysis (i.e. surface ET, surface runoff, infiltration to soil) and pollutant load removal estimates for pre- and post-development scenarios. The tool is built upon the open source EPA SWMM5 model providing a user-friendly interface for novice modelers and cross-compatibility with SWMM5 for further model development. LID is a stormwater management strategy that seeks to mitigate the impacts of increased runoff and stormwater pollution by managing runoff as close to its source as possible. LID comprises a set of site design strategies that minimize runoff and distributed, small scale structural practices that mimic natural or predevelopment hydrology through the processes of infiltration, evapotranspiration, harvesting, filtration and detention of stormwater. These practices can effectively remove nutrients, pathogens and metals from runoff, and they reduce the volume and intensity of stormwater flows. The case studies presented at workshops are meant to provide examples of how the tool can be used to model LID practices and treatment trains in real world development contexts, while also providing verification of model output accuracy in instances where monitoring data are available. Model outputs from the LID TTT should not be interpreted as definitive, particularly in cases where detailed calculations from models used for site design may differ. A new Version 1.2.1 of the LID TTT has been updated with revised default Land Cover Event Mean Concentrations (EMCs), to sync better with local and regional data associated with these various land cover options and associated TSS and TP loadings generated from the tool. Please see release notes for v1.2.1 for details. 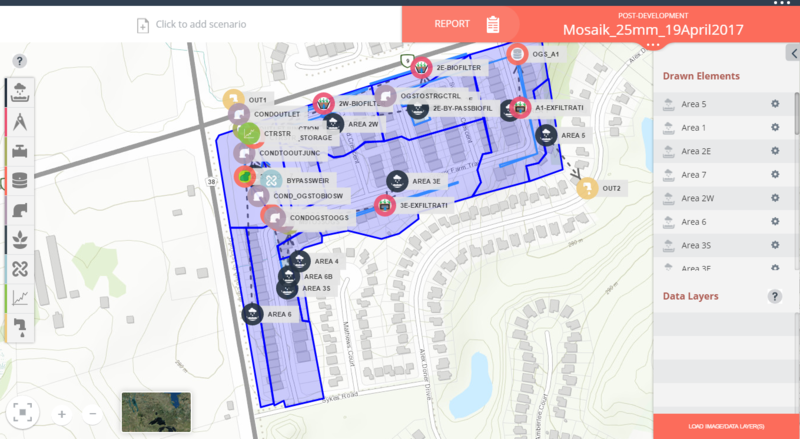 The development team would like to acknowledge that in an earlier case study for the Mosaik site presented over the past 6 months, peak flow matching results were not adequately represented and have been corrected. A revised version of the case study with modified results will be posted soon.